I was watching TV and it hit me. Talent branding has gone mainstream and it has become personalized. Probably most of you have seen GE’s funny TV ads about Owen – the software engineer talking with his skeptical parents about his new job. First, it’s amazing that GE invested in a series of primetime TV ads to promote its talent brand. 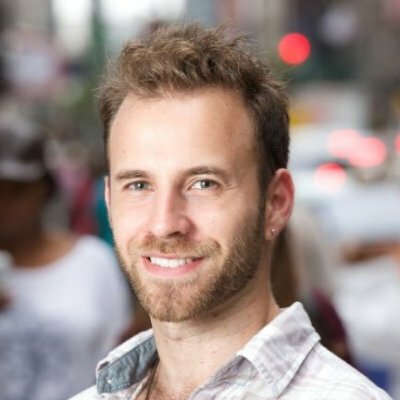 What a great testament that a talent brand is no longer just a “nice to do”– it’s a must do. Second, it’s fascinating that the GE ads didn’t talk to all professionals – they targeted software engineers only! GE crafted a very personalized message with a very personable character and made it clear that software engineers have a very bright future at the company. What a great way to resonate with their priority talent pool. Now if you are thinking, “that’s great, but I cannot afford primetime TV ads,” then don’t worry. The main message here is that personalization of your employer brand, aka targeting a specific subset if your audience with a story tailored to them, is where you should invest. Personalization will create better engagement with your employer brand and help you build a more robust talent pool. 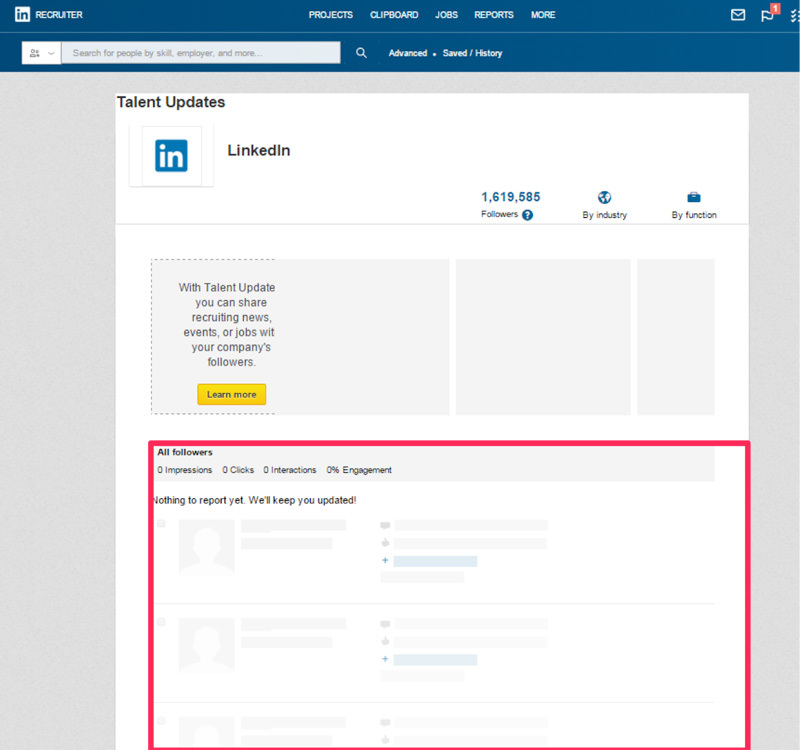 And you can easily use this strategy on LinkedIn to start creating employer branding content that will resonate with your audience. Your LinkedIn Company Page followers are people who have already raised their hand and said they want to hear from you. 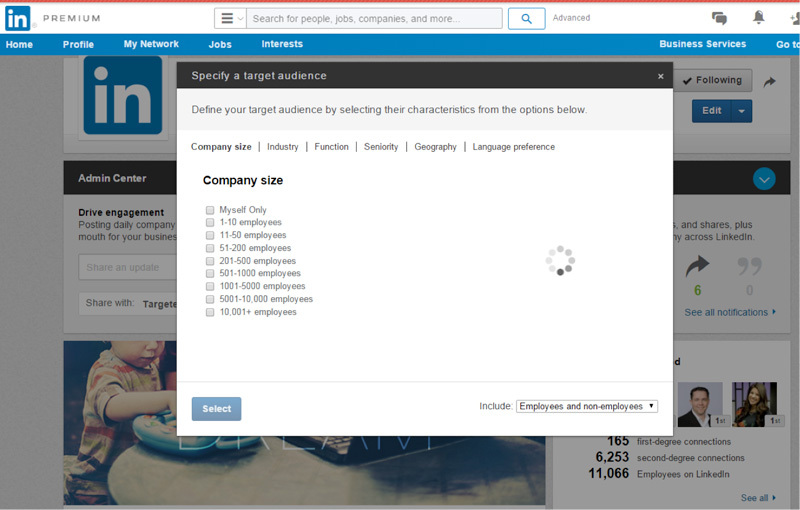 We also know that if someone follows your company on LinkedIn, there’s a 79% chance that they are interested in your organization as an employer. They are also 95% more likely to reply to an InMail and 60% more likely to re-share content that you share with them. These are massive numbers, so focusing on engaging your followers in the right way is absolutely key. And there is a little known trick to personalizing your company updates so that you can share content with one specific audience and not bother or annoy others. Below, you can see that when I select “Engineers” I’m given the total number of followers that this update will reach (I had to block this out for privacy, but you get the idea). You can filter even further by location, seniority, or other elements to make your message even more specific. For example, if I’m hiring software engineers in Poland, I would very likely see a much stronger engagement/success rate if I shared an update about our great engineering opportunity in Polish and targeted it by geography = Poland (or all of Europe even) and then function = Engineer. Then, when you click “share,” the update will only go into the feed of your specified audience (and not into the feed of anyone else). As you can imagine, if Polish is someone’s first/primary language, an update in Polish should resonate very well. And because we targeted the update, anyone not living in Poland won't see the update in their feed, avoiding confusion and possibly annoyed non-Polish speaking followers. 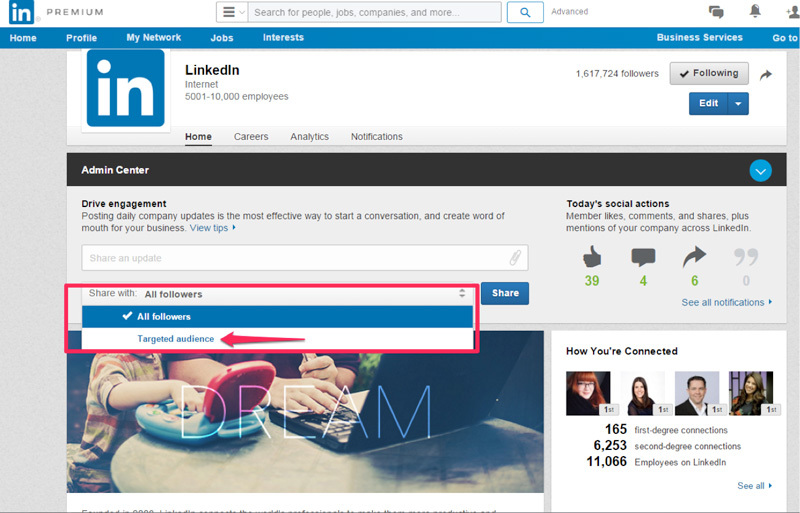 What we just went over is the standard way to share content on LinkedIn directly from your Company Page. 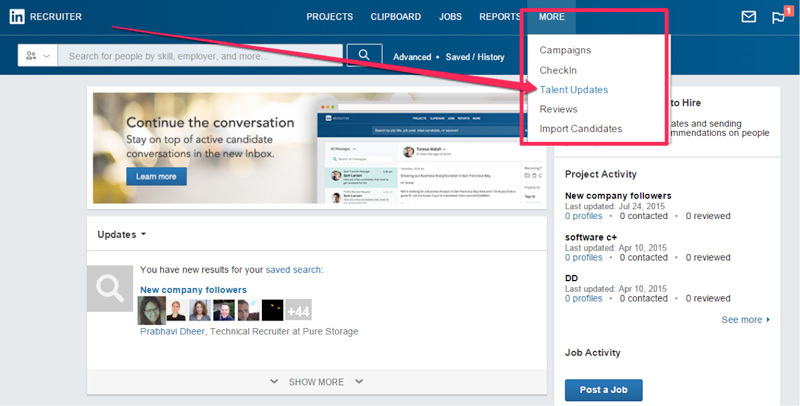 But there’s a different want to share content that allows you to track members that engage (like, comment, share, click) with any of your talent-related updates so that you can put them in a project folder and reach out to them. You can do this with Talent Updates. 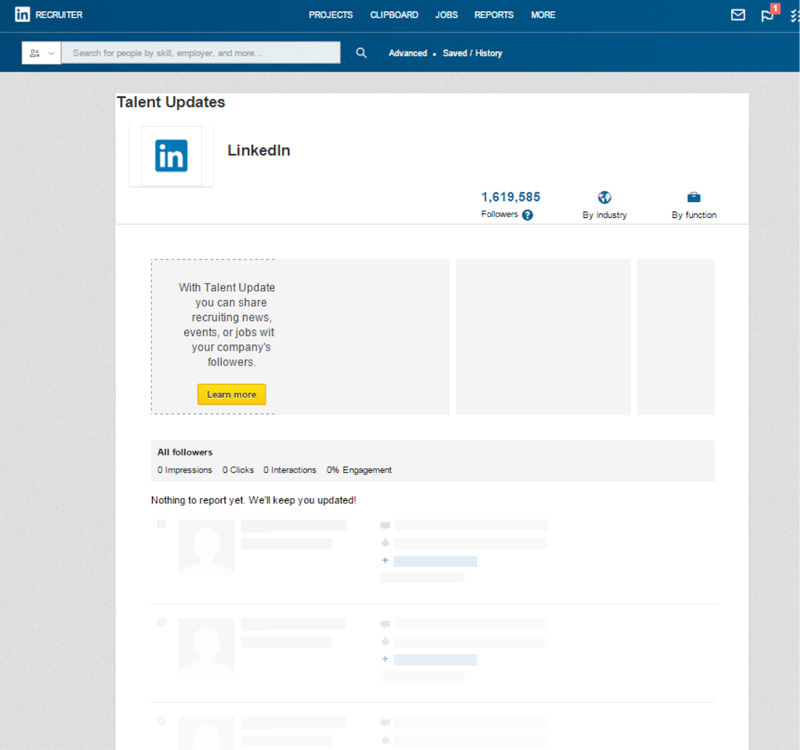 Talent Updates allows anyone with a LinkedIn Recruiter license to share talent-related updates with their followers directly from the Recruiter platform. You can find it under the “more” tab in Recruiter. When you share an update from here, it behaves the same way as it would if you shared an update directly from the Company Page (including audience segmentation). If used correctly, this is a game changer. It’s the ultimate strategy in communicating with passive candidates. 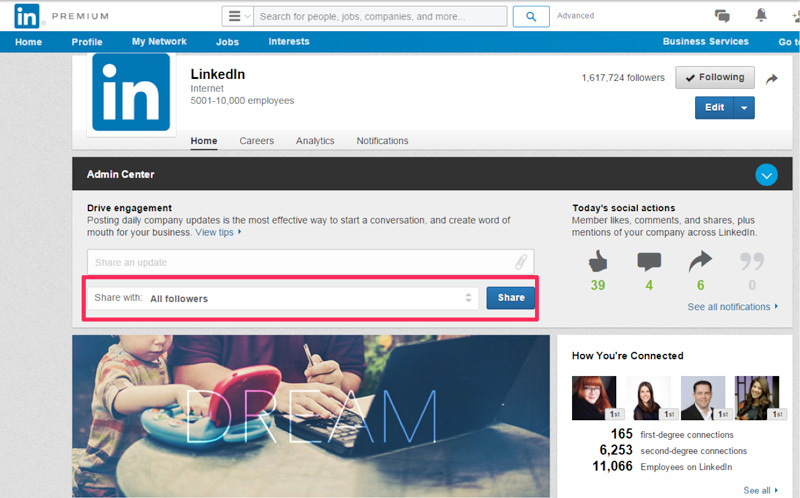 You can also reach beyond your follower base by using sponsored content. 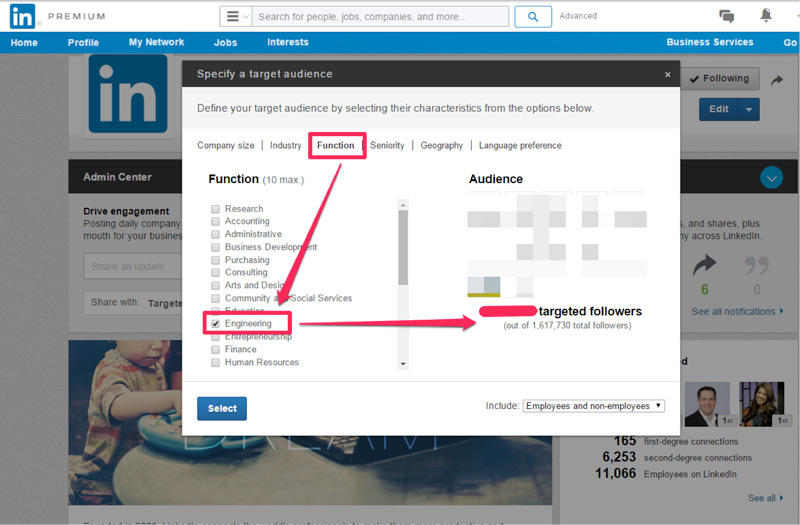 If you use Linkedin’s pay-per-click sponsored content tool, you are able to get your content (including a job opportunity with the job link) in front just about anyone outside of your follower base with extreme precision. So, say you want to create engaging personalized content to attract top engineers to your company. Well, Dropbox did just this by using Sponsored Updates to first grab the attention of their target audience (engineers) and then followed it up with an update (sponsored to the same audience) about an open engineering role. Pretty cool right? Instead of just blasting their followers (or non-followers with Sponsored Updates) with job opportunities, they warm them up with a great article written by a lead engineer, Jessica McKellar, who writes about what it means to be an impactful engineer. Then, shortly after, they sent another update that includes a job link, but you can see that they used some of the same content from the previous warm up message. This is so the reader has a reference point and there is continuity and consistency, which will increase engagement and conversion. In a world of over-advertising and constant distractions, people are paying much more attention to content that is tailored to them. So, by personalizing and targeting your content to the talent you want to attract, you’ll be more likely to get their attention and interest in your company. In addition, appealing to people on a more personal level will build your employer brand, making getting great talent in the door in the future even easier.